We regularly review leading independent schools to ensure our education consultants have a thorough and up-to-date knowledge of any schools that may suit your child. If you are considering sending your child to Emanuel School, please read this review or for more information about Emanuel or similar schools in London, please speak to one of our education consultants or use our online enquiry form further down this page. Founded in 1594 by Anne Sackville, Lady Dacre and Queen Elizabeth I, Emanuel School is a co-educational day school for children aged 10 to 18 in Battersea, London. The school, “prides itself on being a genuine community of altruistic and aspirational young people and staff, one that shows kindness and respect to all”. Fees are £6,194 per term, which for a high-ranking, central London day school with rigorous academic and pastoral standards, as well as first-class facilities is extremely good value. It therefore comes as no surprise that this school is heavily oversubscribed each year, with only 48 places available at 10+, 96 places at 11+, approximately 6 places at 13+ and 20 places at sixth form. 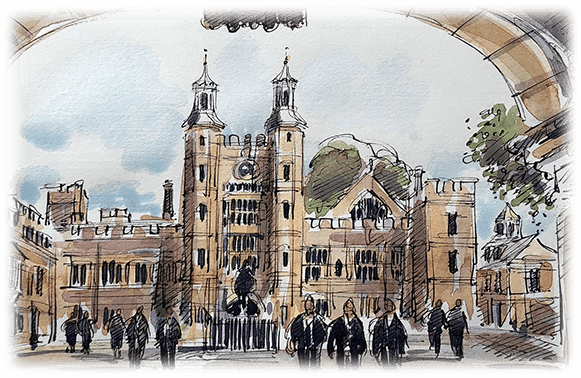 The school campus is thriving and pupils can select from a wide range of extra-curricular activities, including drama competitions, singing in iconic churches across London with the chapel choir, and joining an extensive number of sports teams. Academic standards at Emmanuel School are also climbing, although Emanuel doesn’t quite match St Paul’s or Westminster. A strong sibling policy is operated and entry points are rigid. All children are interviewed and the school takes children it feels will be a good fit, rather than children who are lucky enough to perform well on a standardised entrance exam. Parents are advised to start the application process at least one year in advance, although occasionally more places do become available throughout the year. We were very impressed by the school’s alumni. There are wall-to-well celebrity actors, writers and directors, and that is even without mentioning the inventor of the Internet. This mirrors the occupations of the school’s current parents, which tend to be professional, media and self-employed. The school’s social make-up reflects its prosperous South West London surroundings. Every student we met seemed to be extremely happy, relaxed and respectful, without a hint of stuffiness or arrogance. To learn more about Emanuel School or to find a school perfectly suited to your child, please call one of our education consultants today.